The value of new bicycle trails is often underestimated in terms of overall benefits, but this is particularly true for business generation. The lack of admission fees to directly measure the willingness to pay for new or improved trails means that it is not easy to measure business benefits of such trails. This is not a new issue and parallel difficulties in valuing public parks and other community venues. Standard techniques have been developed for measuring the willingness to pay for the benefits of public trails and greenspace (McConnell and Walls 2006; Krizek 2006). Although there are established ways to measure general benefits such as increase in home value, the measurement of benefits for local businesses has been less common. This article concentrates on ways to measure the business benefits of trails or trail improvements. The business benefits can come in several different forms (Flusche 2012). One form is tourism. Trails can become popular if they are set in a special setting or are of high quality. For instance the Great Allegheny Passage which runs from Pittsburgh, Pennsylvania to Cumberland, Maryland has become a seasonal attraction (Figure 1). Ridership on that 150-mile long trail has grown substantially in recent years to more than 900,000 trail visits. The last phase of the Great Allegheny Passage was completed near Pittsburgh in 2013, finalizing the connection to Washington, DC along the C & O Canal. This has created a non-motorized corridor of 335 miles. As a result trail use increased from 816,000 to 926,000 (23 percent) between 2013 and 2015 (Herr 2016). A 2015 survey indicates that two-thirds of trail users involved overnight stays (Trail Town Program 2015). In addition to overnight or multiday stays along trails, local businesses spring up to serve tourists drawn to the area. This means an increase in grocery and restaurant sales, bicycle related repair shops and specialty stores that are oriented towards tourists. There also can be a difference in the business development based on the location of trails. For those in urban areas the main benefit may be the local stores around trail easy access points. In rural areas, many towns have specialized businesses to accommodate trail users. Such business development is intensified in towns along the trails because of the few services in rural areas. The question addressed in this posting is how to measure the business development benefits of trails. Most people are familiar with the service centers that pop up around national highway exits. The same types of benefits accrue to major well done trails that draw a high number of riders and pedestrians. In urban areas this demand is more spread out through the community because of the many access points to trails. Bikes can be parked anywhere so riders can have access to businesses all along trails. In rural areas the growth of services generally are in the towns along the trail. A well designed trail can be very popular, especially if it connects with other bicycle infrastructure or interesting tourist attractions. People using the trails will either come from local areas for day trips or from more distant locations for stays of one or more nights. At the minimum, day trippers might spend money in restaurants or grocery stores for lunch or dinner. Those coming from a distance will stay in hotels or other accommodations. In addition, groups of trail users might dine in local restaurants and make day purchases from local stores. The basic method for approximating the benefits of a new trail or trail improvement is to estimate a business as usual scenario and what would happen in local businesses if the trail is not built or improved. After this, it is necessary to estimate what would happen if the trail or trail improvement is built. The difference between these two scenarios is the benefit of the new or improved trail for business. This is easier for a new trail, because the before case would be no trail use. It is more difficult for trail improvements. Two types of information are necessary to estimate the business benefits of new or improve trails. They include (1) the incremental number of users drawn to the trail and (2) the economic activity of these additional users. The most accurate way to do this is with before and after surveys of actual business development. However, in assessing the possible benefits of a future project it is sometimes necessary to project possible purchases made by incremental trail users that might occur due to a new or improved trail. Generally it is quite difficult to survey all the businesses that would benefit from a trail. This would require a quantification of sales and profits. This is information most businesses would not want to divulge. An easier method is to use a trail survey of users conducted during different times of the year. This is necessary due to seasonality of trail use. Questions might include the usual residence of riders and whether they stayed overnight to use the trail or trail improvement. Again such estimates can be made based on before and after surveys to measure actual increases in local business development, or they can be projected based on past experiences with similar trails. To make projections of trail benefits it is necessary to calculate the number of trail users. Total trail business benefits will be determined by the number of people drawn to use a trail. Thus, the first step for estimating business benefits is to properly count trail uses. This must be done during different time periods because of the varied time of day and seasonal patterns of use for many trails. It is important to count the number of trips by people using a trail every month or every quarter over a period of a full year. Having counts of nearby bicycle and pedestrian traffic also can benefit local businesses to estimate demand for their services. Automated devices are available for counting trail traffic. Common devices include loops in the pavement measuring pressure, laser devices, magnetic counters and thermal apparatus. Recently some automatic trail counters have been developed that provide real time measures of trail use (figure 2) and download them to a public internet site. By counting the number of trail counts it is possible to measure the changes that result from a new trail, a trail extension or an improvement in the trail. In the case of a new trail, since the previous level of ridership was 0, the total new count can be used in estimating the benefit for a trail. Although counters measure trail traffic at a certain point, what is really needed for estimating business benefits is the number of discrete trips due along the entirety of a trail. The total trail user count has some problems in representing the unique number of trail trip uses. Counters are fine for estimating the traffic at one point on a trail, but they are not very good for evaluating the number of bicycle or pedestrian trips. The traffic by a trail point contains a certain degree of double counting for bicyclists or pedestrians who ride or walk one direction and then return to the same location. This means they pass the counter twice on the same trip. If counters are too close together then they will count the same rider multiple times. If they are too far apart, they will miss bicyclists or pedestrians who enter and exit the trail between counters. The figures needed for economic analysis of business development is not traffic at a certain location, but rather the important figures are the number of discrete trips. Also counting the same person on multiple days is not a problem for economic analysis. If a short- or extended-stay tourist rides on consecutive days, they still will eat meals and stay overnight and hotels, thus contributing to the local economy. The problems of counters can be mitigated by using some statistical techniques to make adjustments to the raw data. By making adjustments it is possible to accurately represent the number of individual rides or walks (for details, see Martin 2017; Martin et. al 2017). In order to do this it is necessary to conduct a survey of bicyclists or pedestrians at the counter locations. The information necessary is the length of the ride or walk and whether the riders or pedestrians are going one or both ways on the trail. 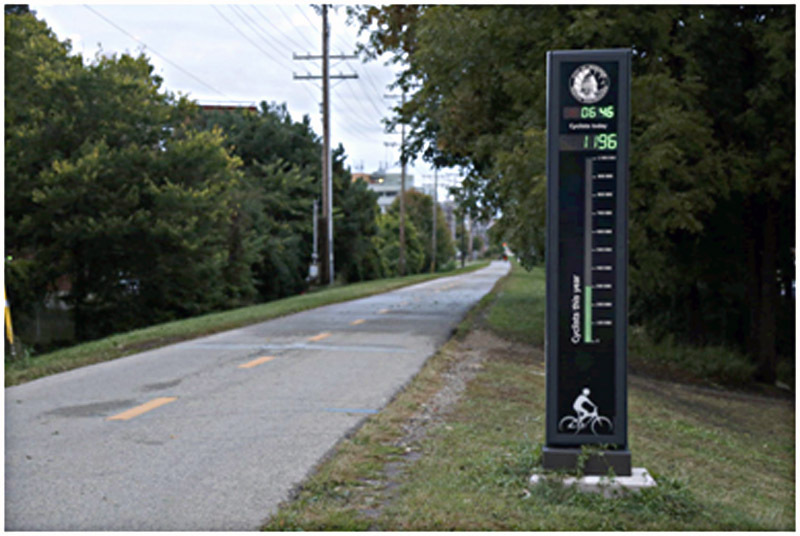 With this information it is possible to calculate the unique number of bicycle or pedestrian trips on the trail. Getting as close to these figures as possible is necessary for the economic estimates of the business benefits of new or improved bicycle trails. The permanent residents who live in the immediate vicinity of a trail also will benefit from the trail, but they generally do not result in additional benefits to local businesses. The benefits for local populations can be measured as an increase in the value of homes, improved health, less expensive commuting and other measures. These more general benefits are described in a previous post entitled A Primer on the Value of Bicycle Trails and Greenways (Barnes 2017a). There are many methods to randomly select and interview trail users. One of the easiest method is to select every 10th or some other number of bicyclists or pedestrians during a predetermined time of period. The nature of rider or walker may change during the day. Commuters may ride in the morning and those out for exercise may be more prevalent during other times. With beforehand knowledge of the number of trail users during certain time periods, then certain representative periods can be sampled and adjusted to provide an overall profile of trail users. The focus of this inquiry is on the questions necessary to extract information that makes it possible to measure business benefits of trails. It is wise to keep these surveys short and to collect mainly key information relevant for benefit estimates (PCMPO 2014). An important issue is to classify the type of residence or accommodation of trail users. The first set of questions is for understanding the means of reaching a trail and distance from someone’s usual residence (figure 3). Once this is accomplished, it is possible to determine those bicyclists or pedestrians who will stay in hotels, rental units or with friends. As an alternative for viewing, this file contains a Word document with all the questions for surveying business benefits of new or improved bicycle trails. In addition questions are necessary to determine the money spent while staying in nearby accommodations. This will be applied only to those whose usual residence in not near the trail. Different expenses can be applied as a trail benefit based on whether this is a rental home, a condominium or a hotel stay. The local market price for the rental homes, condominiums and hotel stays has to be researched in order estimate a value to the local economy. Using this information is often better than asking the trail user how much they paid for a hotel or condominium stay because people consider this sensitive information. The might result might be refusals to answer the question resulting in inaccurate information. The third set of questions is for estimating the amount of money spent on food or other items as a consequence of staying near or using the trail. Again, this type of information will be applied only to those trail users who can be considered short- or extended-stay tourists. The last question is for any non-food item purchased due to staying near the trail. It is not limited to trail related expenses. The tourist benefits for business in locations near the trail cannot be attributed to a larger area such as a region or state. The assumption is that the trail has drawn short-term or extended-stay tourists to an area due to the attractiveness of a new or recently improved trail. This means that the tourists will have many destinations from which to choose or decide. The key is that the new or trail improvement influences the decision to visit the area and as a result they patronized local businesses. For any particular trail study the above questions will have to be modified to fit local conditions. They have been developed to provide a starting point for measuring the additional demand of tourism for local businesses due to a new trail or trail expansion. The benefits are actually a form of willingness to pay for a visit to the nearby trail. They just take the form of paying for hotel stays, food services and local business wares. It is mainly short- and long-term tourists who would generate such business benefits. Permanent or usual residents near the trail would not generate incremental business tourist expenses since they already live in the area of the trail. Communities often undervalue the socioeconomic impact of offering attractive bicycle and pedestrian facilities. The development of new trails or the improvement or extension of existing ones can have many benefits. However, the benefits for local businesses are often not quantified because they are difficult to measure. New or improved trails generally do not charge admission fees, so their value must be accessed through other means. Well done trails that have limited interaction with traffic will draw many people to use them from both near and far away. The increase tourist spending in proximity to trails can be a significant source for business development. This would include stays in hotels and other tourist accommodations along with patronage of food services and retail stores. A similar but not identical version of these methods for measuring the business benefits of new or improved trails has been applied in a case study of the extension of the Legacy Trail in Sarasota, Florida. The name of the study is The Value of the Legacy Trail Extension for Sarasota, Florida (Barnes 2017b). This was completed in 2017 and documents that the business benefits are between $55 and $80 million. This case study will be described in a future posting on the "Business Benefits of Trails: The Case of the Legacy Trail Extension in Sarasota County." Barnes, Douglas. 2017a. A Primer on the Value of Bicycle Trails and Greenways. Washington, DC: Doug Barnes www.dougbarnesauthor.com. Boker, J., John Bergstrom, Joshua Gill, and Ursala Umanski. 2004. The Washington and Old Dominion Trail: An Assessment of User Demographics, Preferences, and Economics. Report prepared for the Virginia Department of Conservation, Richmond, Virginia. Flusche, Darren. 2012. Bicycling Means Business: The Economic Benefits of Bicycle Infrastructure. Washington, DC: Advocacy Advance—A Partnership of the League of American Bicyclists and the Alliance for Biking and Walking. Herr, Andrew. 2016. Analysis of 2015 Trail Use Patterns along the Allegheny Passage. Report prepared for the Allegheny Trail Alliance, Pittsburgh, Pennsylvania. Inveiss, Maija. 2016. ·”New technology counts how many people are on State Street” The Badger Herald, Madison Wisconsin. September 20, 2016. Krizek K. 2006. 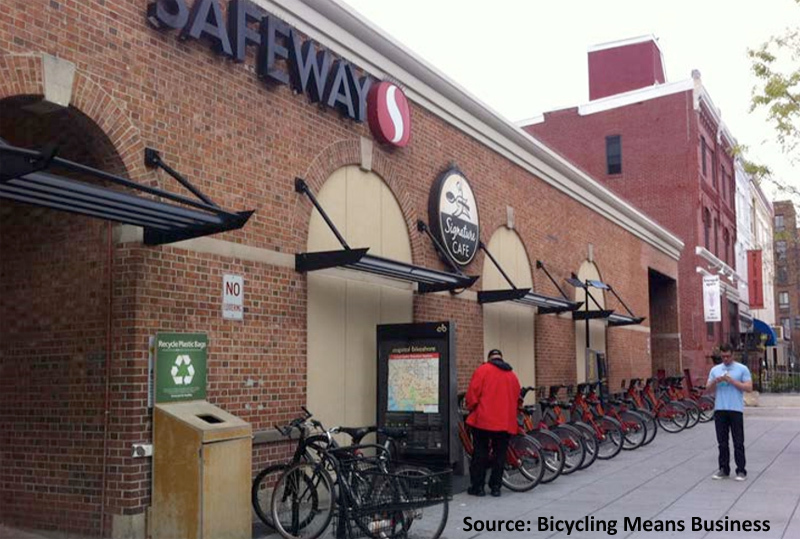 “Two Approaches to Valuing Some of Bicycle Facilities’ Presumed Benefits: 2007 National Planning Conference in the City of Brotherly Love.” Journal of the American Planning Association 72(3): 309–20. Martin, Stephen. 2017. “Calculation of Trail Usage from Counter Data.” Report prepared for Friends of the Legacy Trail, Venice, Florida. Martin, Stephen, Megan Donaghue, Jerry Drol, Darryl Lang, Carla Martin, Caroline Nondin, Roger Normand, and Andrea Seager. 2017. "Results and Analysis of a Survey of Users of the Legacy Trail and Venetian Waterway Park Performed during June and July of 2016". Friends of the Legacy Trail Report, Venice, Florida. McConnell, Virginia, and Margaret Walls. 2005. “The Value of Open Space: Evidence from Studies of Nonmarket Benefits.” A Resources for the Future Paper, Washington, DC. PCMPO (Pinellas County Metropolitan Planning Organization). 2015. “2014 Pinellas Trail Survey of Users.” Pinellas County Metropolitan Planning Organization, Florida. Trail Town Program. 2015. "Trail User and Business Survey Report: Great Allegheny Passage". Report prepared by the Trail Town Program, Pittsburgh, Pennsylvania. US Census.. 2018. “2020 Census Residence Criteria and Residence Situations.” US Census, Department of Commerce, Washington, DC. Accessed 2018.